IT'S OFFICIAL, COUNTDOWN STARTS NOW! First, I apologize to those blog friends of mine who has been asking to have an exchange of links and I have not responded, it’s just that sometimes in the middle of my blogging work, things just get messy and I don’t know what to do anymore, but I’m finding a win-win solution to this dilemma of mine. Second, I have two new blogs Table for Five and Petty Things In Life that need links, so please let's exchange links. 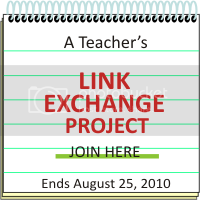 Thus, I’m launching a project, A Teacher’s Link Exchange Project. Those who wished to have a number of link exchanges in one sitting, then this is the solution to our problem. Make a blog post of this project with an anchor text 'A TEACHER’S LINK EXCHANGE PROJECT' linking to this POST. Those who have just launched a blog can join. Have the project badge in your side bar during the duration of the project. Just copy the code HERE. Comment on this post saying 'Link Me' and include the link of your blog post. Blog URLs submitted not in this format will automatically be deleted. This project will run until August 25, 2010. All links will be collated and will be sent back to the email you used in the form. Good luck everyone, thanks for participating.